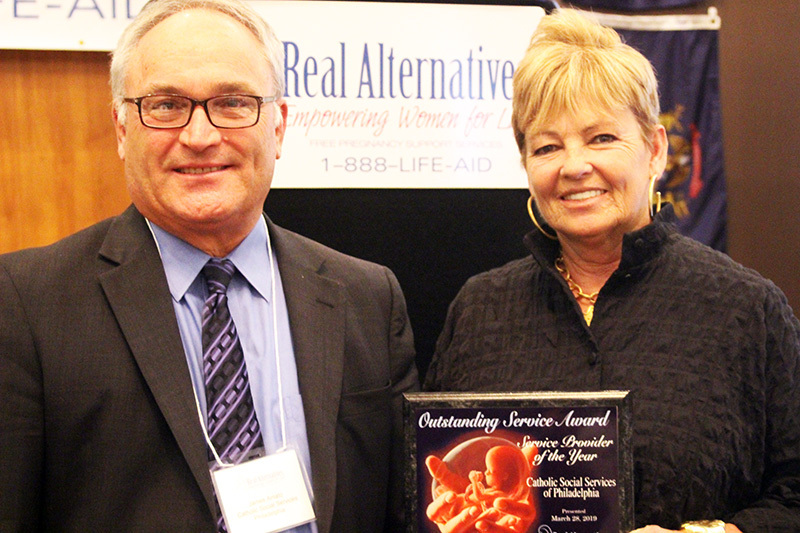 For the seventh consecutive year, Catholic Social Services (CSS) of the Archdiocese of Philadelphia has been named Service Provider of the Year by Real Alternatives, the non-profit organization that administers Pennsylvania’s Pregnancy and Parenting Support Services Program. CSS also received Real Alternative’s site of the year award for a social services agency. “I’m proud to be part of a church and part of an organization that supports women who are pregnant, and does so in such a positive way,” said Amy Stoner, director of CSS’s community based and homeless services divisions. 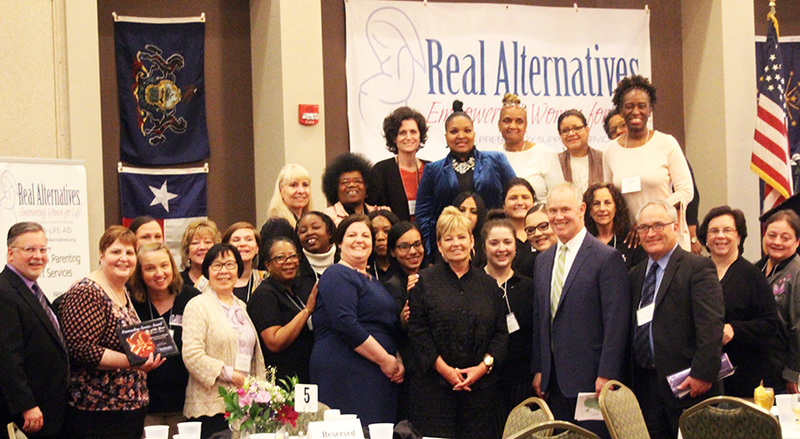 Stoner joined secretary for Catholic Human Services James Amato and some 30 CSS staff members to accept the honors at Real Alternative’s annual conference held March 28 near Harrisburg. In 2018, CSS assisted more than 5,000 pregnant women by providing access to free counseling, education about reproductive health concerns, prenatal and parenting support groups, guidance in finding appropriate medical services and referrals to adoption services for interested clients. The archdiocesan agency reaches clients through its five family service centers located throughout Philadelphia and its surrounding counties. The mission of Real Alternatives and its providers is more urgent than ever, said Harrisburg Bishop Ronald W. Gainer, president of the Pennsylvania Catholic Conference, which is the public affairs arm of the state’s Catholic bishops and dioceses. During his luncheon remarks, Bishop Gainer pointed to a “new ferocity and a bold extremism” among those in favor of legalized abortion. Staff from archdiocesan Catholic Social Services (CSS) celebrated receiving their seventh consecutive award as Real Alternative’s Service Provider of the Year, March 28. CSS assists over 5,000 pregnant women each year through a continuum of supportive services. Turzai, the Republican majority leader and speaker of the state house, commended the more than 155 conference attendees and said the number of abortions sought by Pennsylvania residents reached an all-time low in 2017, while there has been “an overall decline in abortions by 27.7 percent” since the inception of the Real Alternatives program in 1995. The agency’s website reports that more than 302,000 clients have been served to date. Turzai drew applause for his pledge to secure “increased funding and less bureaucratic entanglement” for Real Alternatives providers. He said payments for providers, including CSS, totaled $6.4 million in 2018. According to Stoner, every penny of such funding is maximized by CSS, which provides specific services that are reimbursed by Real Alternatives according to its guidelines and parameters. At present, CSS receives approximately $500,000 each year in such reimbursements. The balance of its funding for this work is generously subsidized by the Archdiocese of Philadelphia and the Catholic Charities Appeal. Stoner added that CSS actively seeks out women who find themselves overwhelmed or uncertain when facing motherhood. “We go where pregnant moms are, and we make a connection with them,” she said. CSS, which offers free pregnancy tests, will soon begin targeting college campuses to expand its outreach. In addition CSS is also seeking out two pregnancy populations normally overlooked: women in prison and women in recovery. Incarcerated women “are hungry to connect and to talk about their pregnancy in a place that can be depressing,” and women in recovery need help in remaining focused on their sobriety while raising children, Stoner said. Stoner noted that poverty in particular makes many women “abortion vulnerable.” Financial struggles can profoundly impact an expectant mother’s health, which is why she and her team provide “comprehensive help with very practical things,” including access to supplies, benefits, medical attention, parenting resources and, if clients request, adoption services. Because of its long history and numerous partnerships, CSS offers a continuum of care for pregnant women, tailoring its approach to best serve the needs of a given client. “Every pregnant woman we encounter has her own unique story,” said Stoner, noting that this individualized approach has led pro-life advocates such as the Sisters of Life to increasingly refer women to CSS, she added. “We offer community baby showers, Mother’s Day teas – fun activities and cool things that draw in women whom we might not otherwise reach,” she said. After a woman gives birth, CSS remains equally invested in her and her child. “We’re there for the long haul,” Stoner said, pointing to CSS’s numerous parenting classes, which incorporate five protective factors that can prevent child abuse: social and emotional competence; knowledge of parenting and child development; social connections; concrete support and resilience. The factors are part of the Strengthening Families program, an internationally recognized social services model originally developed in the 1980s by psychologist Karol L. Kumpfer and now implemented widely throughout the United States. CSS utilizes the program at a number of its agencies, including its Catholic Community Services and Out of School Time (OST) sites. Fostering social relationships eases the isolation faced by many pregnant women, said Stoner. Norristown resident and mother of eight Ruth Sanders has relied on CSS’s pregnancy and parenting services for six years. “I love them to death, and they have been a real blessing to me and my family,” she said. Over the years, CSS’s Norristown Family Service Center staff has provided Sanders and her family with food, diapers, children’s clothing, beds and even a $25 card for the local laundromat when the wash had piled up. In addition to meeting such practical needs, CSS provided parenting classes in which Sanders has earned several certifications. She is now exploring options for assisting fellow parents by volunteering at the center. Stoner said that such ongoing connections between CSS staff and clients are at the heart of the agency’s mission.